Dr.Yozo is the TIG welder but not general TIG welder. 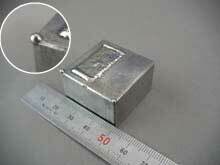 There is the difference in the operating method between Dr.Yozo and the general TIG welder. The general TIG welder keeps generating the arc and form the molten pool. When the welding materials are applied to the molten pool, the weld beads are formed. Dr.Yozo can form the One Point Molten point (a welding spot) by the instantaneous arc and the weld beads are formed when the same works are repeated. – It is a entirely new technology to enable the precision welding with very little shrinkage and little heating up.With this new system, the worker without any knowledge of TIG and ARC weldings can easily do the Good precision welding. 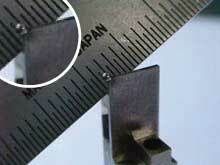 – Manually, the small amount of metal can be welded on the surface of die and any steel parts with little heat. then it is welded by an arc to make one spot welded. – The heat by Arc is very little and it does not damage the work and it surface by heat and there will be little troubles of shrinkage, distortion, bending, undercut. 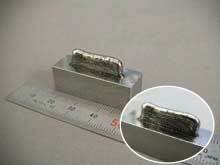 – There will be no influence of the heat around the welded point and does not give any scratch/crack. – A hand holding a tungsten electrode can touch the work while welding to make the welding work easier and can hold a good gap (and arc length) between the tungsten electrode and the work surface for better welding. Plastic mould die, press die, die cast die, rubber mould, blow mould die, lost wax die. To repair the surface, the parting lines, all innerouter,3 points corners, pinholes,welding under cut, where various kinds of troubles/improvement/modifications are required, e,g, shrinkage, hair crack, scratch, sink mark, blow hole, wearing, gasdamaged, crack, design change, cuttingmistake, etc. Pinhole, blow hole, sink mark, scratch, crack, wearing, design change, miscut. steel, titanium alloy, nickel alloy, inconel, cobalt alloy, stelite, tool steel, white metal and other alloys. Gas preflow time 0.8 sec. Gas afterflow time 3 sec.